Charles Davis has been around a long time – he is now 81 years old. In addition to his considerable experience on the jazz scene, he is a saxophonist of some versatility. Known originally for his work on the baritone sax, from the 1990s onwards he began to play more tenor sax. This CD, which incorporates a moving tribute to his late wife, Lori Sarnet-Davis, as well as to fellow-musicians Kenny Dorham and Cedar Walton, has him exclusively on the tenor. The disc features a three-horn front line: Davis plus trumpet and trombone, backed by a rhythm section. 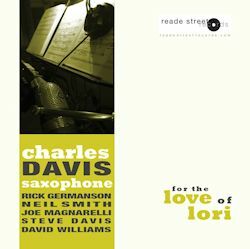 There are three Charles Davis original compositions including the title track For the Love of Lori, and a further homage KD (for trumpeter Kenny Dorham, with whom Charles Davis performed and recorded in 1959-60). There are also two standards, both chosen, no doubt, with his late wife in mind, and Cedar Walton's Cedar's Blues plus other pieces by Putter Smith and Julian Priester. The result of this combination of musicians and material is a treat for those who take their jazz straight. Charles Davis plays tenor with passion and deep feeling throughout, Joe Magnarelli on trumpet gives an articulate and virtuosic performance and Steve Davis is effortlessly fluent on trombone. This front row is backed by Rick Germanson, both a jazz educator and pianist of choice, a musician of invention and finesse; David Williams, the Trinidadian bass player, who surfaces for a solo on Cedar's Blues but is a stalwart support on every track; and Neal Smith on drums (whose first name is misspelt twice in the credits but not in Pete Malinverni's helpful sleeve notes). It's the mark of a good drummer that he (or she) keeps the show on the road without being over-obtrusive or busy and Neal Smith achieves this. He shows up particularly well on Into the Himalayas. By the way, the ensemble work is first-rate from the start. The Irving Berlin and Sammy Cahn standards are taken at a rather faster pace than we might expect, given the context. The three Charles Davis originals are all appealing – there is an appropriately yearning quality to the beautiful title track, and Into the Himalayas has a strong theme. In summary, there isn't a dud track on the whole album. I'd say that they don't make them like this any more, except that they obviously have!